The Brinkmann King 4-Burner Gas Grill offers a total cooking area of 672 square inches and has four stainless steel tube burners with a total of 40,000 BTUs. It is a fairly professional grill for its price and you should expect decent endurance and performance from it. It’s definitely not a waste of money, but also not a really professional tool. The Brinkmann King 4-Burner Gas grill offers a good overall performance. The thing you will like most about it is the fact that it allows you to cook very even, without burning. It has an integrated lighter that works well and there is a decent amount of storage space under the unit, so you should have everything you need in handy. This grill is easy to assembly and has excellent instructions for amateur users. The caster-wheels allows you to move the grill easily, and the front doors are a real plus as well. Unlike other grills at this price, the Brinkman King 4-Burner has top shelf materials, and should last for a decent amount of time. Although this grill has a good quality for its price, it doesn’t have nearly as much quality as you would expect from a real professional tool. You shouldn’t get your hopes to high with it; it should only last for about a year of regular use before its components start to fail. So you should definitely take that into consideration. If you are looking for a grill that you can use several times for some special occasions, the Brinkmann King 4-Burner can definitely help you with that. Its relatively large cooking area and power should be enough to satisfy the needs of your many guests. 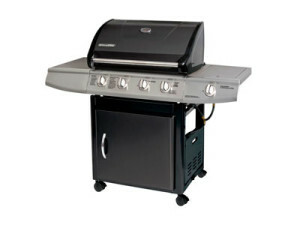 It also has some nice features for a cheap grill, such as the integrated lighter and the stainless steel hood with steel end caps. But if you are looking for a reliable grill that you can use for more than one year, you should definitely look elsewhere.